I walked into Whole Foods the other day and was overcome with emotion at the sight of red and green on the front product table. The little food angels in my head started singing, “it’s the most wonderful time, of the year….”. This was no Christmas in August moment, it was the start of heirloom tomato season!! Did you know that there are over 600 varieties of tomatoes? Traditional grocery stores sell a standard six types and rarely anymore. Farm-oriented markets like Whole Foods will sell a little more, but the best finds are at Farmers’ Markets. Heirloom tomatoes stick out immediately because they are the perfect combination of beautiful and ugly. They are not perfectly round, they often have lumps, but they are the most delicious, sweet tasting tomatoes. Once my little food angels stopped singing, I knew immediately I was making caprese salad for dinner. With only a few ingredients, you’ll find the best success for this recipe using top notch stuff. Fresh mozzarella or burrata cheese is a must and making the balsamic dressing yourself help brings out the natural sweetness of the tomatoes. This salad will taste its best for only another two months or so, so get out to a market and buy those heirlooms while you can! To make the dressing, whisk together the balsamic vinegar, honey, Dijon mustard, and the garlic. Slowly drizzle in the olive oil while constantly whisking the dressing to make an emulsion. Whisk until the oil is completely absorbed. Chill in the refrigerator. Rinse and dry the tomatoes. Cut the tomatoes and the cheese into 1/4 inch slices. Layer on a platter, varying the color and the cheese between the tomatoes. You want an overall ratio of 2/3 tomatoes, 1/3 cheese. 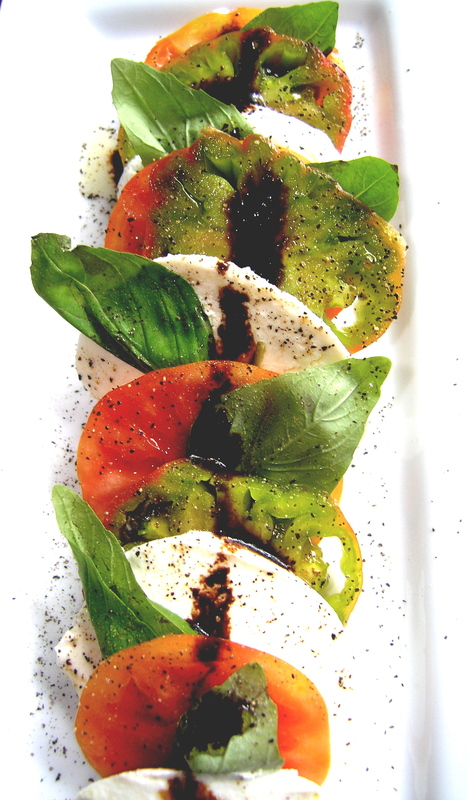 Remove the basil leaves from the stem and place between most of the layers of cheese and tomato. Drizzle with the balsamic, season with sea salt and freshly cracked pepper to serve. Previous postA Sweet Celebration- Back in the Big Leagues!